I first heard about the Buttermilk Drop in a New York Times article, gloriously entitled "A City Drenched in Sugar". I had known that New Orleans was a city famed for its sweets, but I don't think I really knew until I read this article. Not only King cake waited for me in the Big Easy, but doberge cake and snowballs and doughnuts, too. 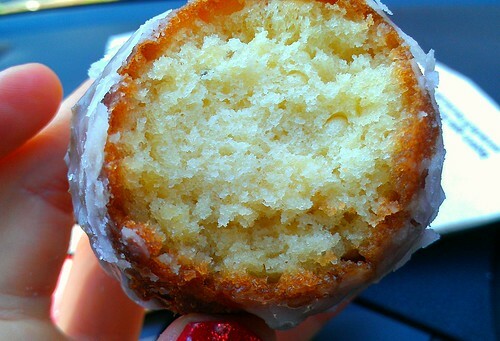 Actually, a particular type of doughnut called the Buttermilk Drop. 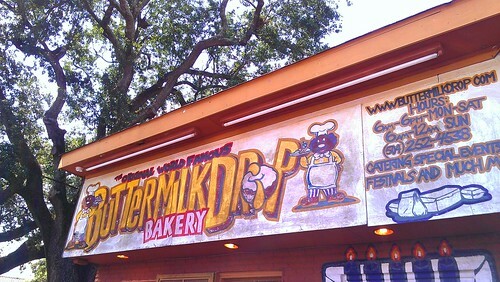 As I learned from this site, the buttermilk drop is a doughnut unique to New Orleans which gained fame at the now defunct but still beloved McKenzie's Pastry Shoppe. It is, on the surface, not an incredibly unique treat. It looks like a doughnut hole, but it's bigger. But not quite as big as a full-sized doughnut. But one taste will tell you that this is a very special doughnutty morsel. Rich in buttermilk, yes, which gives them a perfect delicate crumb yet substantial texture, which is gorgeously and generously coated in a thick glaze. I can understand why New Orleans would simply not stand for this doughnut disappearing. Today, from what I gather, you can get buttermilk drops at two places: Tastee's, which apparently purchased the rights to a number of McKenzie's recipes, and The Buttermilk Drop Cafe. 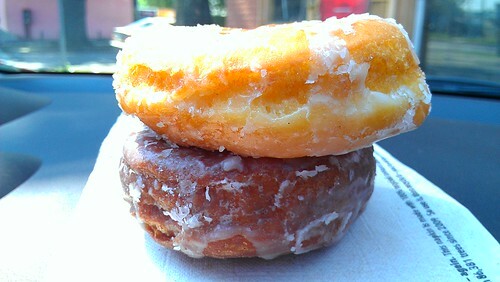 I recently tried them at The Buttermilk Drop Cafe, an establishment with an interesting story. Owner Dwight Henry first gained fame as a maker of sweet treats, then gained local celebrity status when he put incredible effort into helping re-open businesses in his Seventh Ward neighborhood following Hurricane Katrina. And then, he was "discovered" when the movie Beasts of the Southern Wild was filming in his neighborhood, and ended up being featured in the movie. So basically now, in addition to being famous for making doughnuts, he's being featured in New York Times Magazine style shoots. Well, I will tell you, I was intrigued. 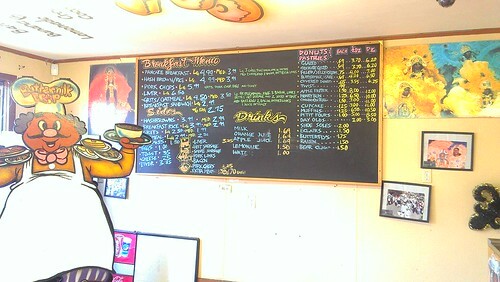 So when you walk into The Buttermilk Drop Cafe, I was greeted by an odd sight. A large room with ample seating space...but no seating. A menu that seemed to invite sitting and staying a spell...but nowhere to sit and stay. 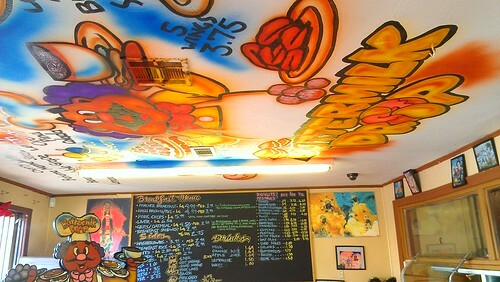 Cool artwork on the wall and even ceiling. 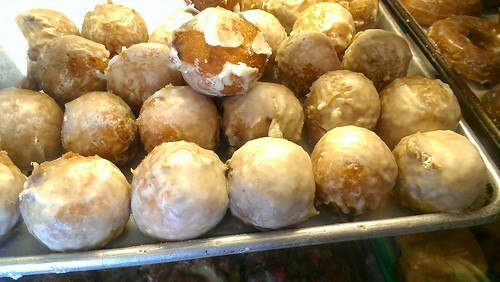 and, of course, the famed buttermilk drops. From behind a small glass window, a friendly girl took our order. It was alarmingly affordable. 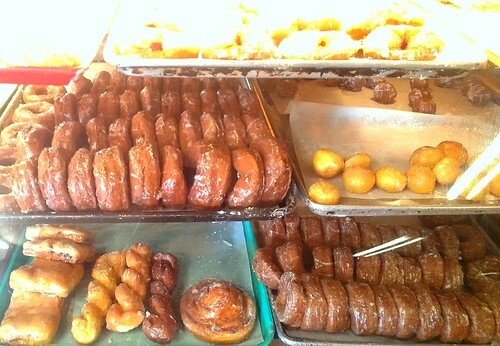 The doughnuts and buttermilk drops were all well under a dollar each, which was refreshing. We got a few buttermilk, a few chocolate, and of course several buttermilk drops. The doughnuts were very, very good. Light in texture, with a solid buttermilk flavor, and most importantly, drenched in a highly delicious glaze. But the real star was the buttermilk drops. Was it the power of suggestion, that I was ready to love these best because I had heard so much about them? Perhaps. But d-a-m-n were they fine doughnuts. The texture of the buttermilk drop is perfect. 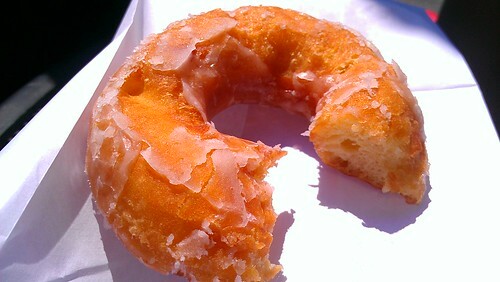 Like I said before, it's a delicate crumb, but a substantial doughnut in nature. I love the size, too. It's more serious than a mere doughnut hole, but not quite a full size doughnut. It is the perfect snacking size. 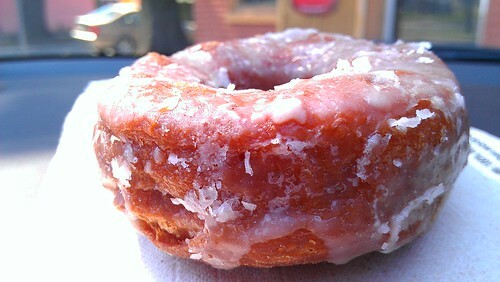 And the glaze was so liberally applied that it kind of fused into the drop's crust...oh, heaven. So what am I saying here? Get yourself to the Buttermilk Drop Cafe. I was impressed by how "real" the place has remained even following its fame. Weird about the seating, but you can deal. This is an experience that must be lived by doughnut lovers. The Buttermilk Drop Cafe, 1781 N. Dorgenois Street, New Orleans. Online here.